The kitchen is one area where many seem to go over the top when buying stuff. Even people who hardly cook still have a full set of pans and pots, oven forms and cake forms in every shape and size. We complain about our kitchens being too small, and there just isn’t enough cupboard space. We might store the nice plates in an extra cupboard in the dining room and all those special glasses for every drink available are on display in the living room. A full set of 12 each! We carry the big pan down to the basement and the extra serving plates get stuffed on top of cupboards to collect dust. The gravy boat for Sunday roasts, the sauce jugs in several sizes, the milk jug for tea parties, those funny lemon squeeze things, the 3 layer cake stand, those espresso cups, the special sushi serving plates and the funny tools used for eating crabs – there just isn’t enough space! Then we have the rice cooker, the deep fryer, the waffle maker and the toaster, that spaceship of a coffee maker and the bread machine. Not to mention the blender, the mixer, the grinder and the KitchenAid. Of course the juicer, the egg boiler and the water boiler… We need more counter space! The thing is, we actually don’t. Nobody really needs any of these items. And pairing down your kitchen back to the very basics can be one of the most rewarding tasks on your journey to a simpler life. You’ll be surprised how far a medium sized pot will take you on replacing electrical items. Take one drawer or one cupboard a day and try to identify 10 items you haven’t used for ages, and don’t really need. Do you have multiple of one item? Like mixing bowls – keep one or two and get rid of the rest. You might have several sets of measuring spoons, or sauce jugs in 5 sizes. Pick your favorite and toss the rest. Once you get through all drawers and shelves – start over again! I bet you can do at least 3 rounds. The fine china – why not use it every day and give your every day plates to someone who needs them more? The 25 coffee mugs cramping your shelves… how about reducing to half that amount? And do something about all those Tupperware boxes and plastic containers. Starting by only keeping those that has a fitting lid, and tossing all the random extra lids without boxes too. f you feel unsure about getting rid of stuff, start by packing the items you sorted out into boxes. Put those boxes away in the basement or in another room. After a month or two you might have more confidence to take the plunge and get rid of the stuff. And here is the best part; contact giving at Lux and tell them you have a few boxes of kitchen stuff to give away. 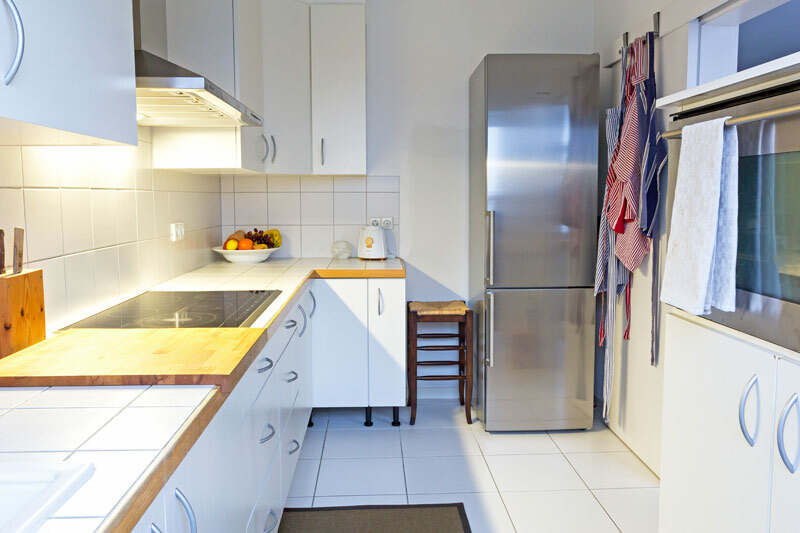 Suddenly, you get to give a family or two a new start – all while you get to enjoy a clutter free kitchen that suddenly feels a lot bigger and more inviting.